Product options include 40-coin rolls, 2-roll sets, 3-roll sets and 100-coin bags. Each contains circulation-quality quarters taken directly from the production floor of U.S. Mint facilities in Philadelphia, Denver, and San Francisco. Lowell National Historical Park was established on June 5, 1978 and includes 141 acres in Lowell, Massachusetts. The park celebrates the important role that the area played in the Industrial Revolution. A total of eighteen different design candidates were presented by the U.S. Mint for the reverse of the Lowell National Historical Park Quarter. The final selected image depicts a mill girl working at a power loom with its prominent circular bobbin battery. Through a window behind the girl, we see a view of Lowell, Massachusetts with its iconic Boott Mill clock tower. 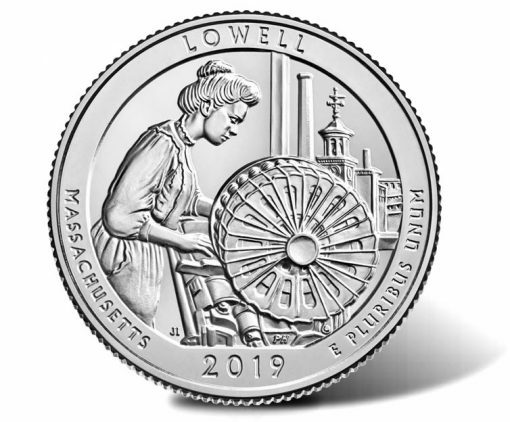 Designed by Joel Iskowitz and sculpted by Phebe Hemphill, the Lowell National Historical Park quarter for Massachusetts depicts a mill girl working at a power loom with its prominent circular bobbin battery. A view of Lowell, including the Boott Mill clock tower is seen through the window. The coin marks the first release this year and the forty-sixth in the U.S. Mint’s America the Beautiful Quarter® Program. Inscriptions on the reverse read: "LOWELL," "MASSACHUSETTS," "2019," and "E PLURIBUS UNUM." The design is by United States Mint artist Joel Iskowitz with sculpting completed by U.S. Mint Sculptor-Engraver Phebe Hemphill. A portrait of the first President of the United States, George Washington, appears on the obverse (heads side) of each quarter. This same basic likeness of the first President has appeared on quarter dollars since 1932 and was the original work of artist John Flanagan. Obverse inscriptions read: "UNITED STATES OF AMERICA," "LIBERTY," "IN GOD WE TRUST," and "QUARTER DOLLAR." A mintmark on the obverse indicates the coin’s facility of production including P for Philadelphia, D for Denver and S for San Francisco. Each roll includes a total face value of $10 of quarters. 100 coin bags have a face value of $25. 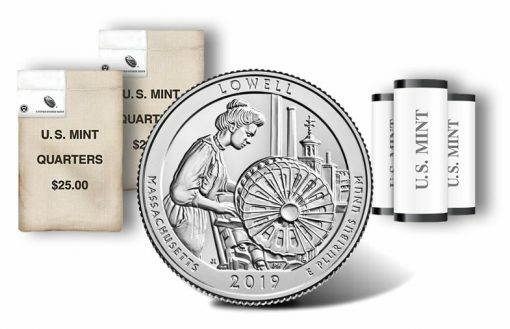 Philadelphia and Denver Mint coins are released into circulation so Lowell quarters from these facilities will eventually appear in pocket change. The San Francisco facility, however, only produces quarters such as these for numismatic purposes. An official release ceremony for the Lowell quarter will be held on Feb. 6, at 10 a.m. EST. The ceremony will take place at the Lowell Memorial Auditorium. Scheduled to attend the event are Marc Landry, Acting Associate Director for the Numismatic and Bullion Directorate, United States Mint; Eileen Donoghue, Lowell City Manager; Jacqueline Moloney, Chancellor, University of Massachusetts Lowell and Celeste Bernardo, Superintendent, Lowell National Historical Park. The address for the auditorium is 50 E Merrimack St. Lowell, MA. Attendees will have the opportunity to exchange cash for rolls of the quarter dollar. On the previous evening, Tuesday, Feb, 5, a coin forum will be offered by the U.S. Mint. The forum will run from 6:30–7:30 p.m. EST — at the Lowell National Historical Park Visitor Center Theater, 246 Market St, Lowell, MA and will give those in attendance the chance to ask questions of Mint officials. 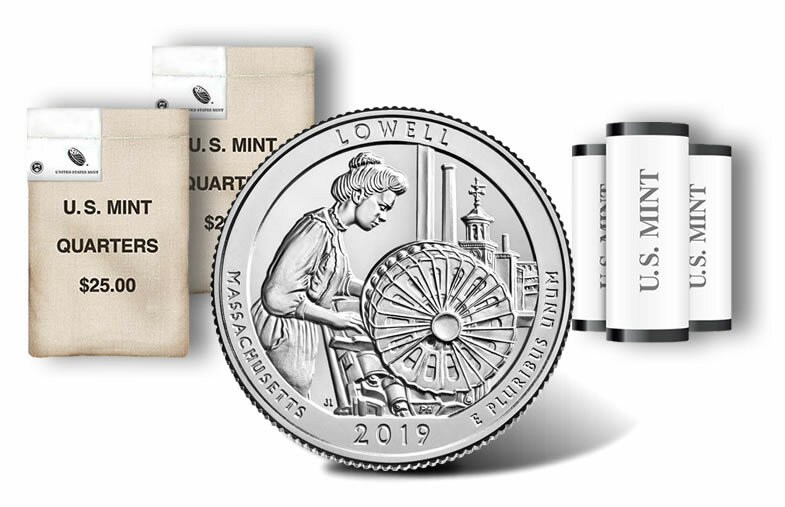 Lowell quarter rolls and bags are available directly from the U.S. Mint’s online store located here. They may also be ordered by calling the U.S. Mint’s customer service line at 1-800-USA-MINT (872-6468). The Lowell quarter is the 46th in the U.S. Mint’s America the Beautiful Quarters® Program which honors sites of national interest. Above is a CoinNews photo of the five 2019 America the Beautiful Quarters. These coins are proof editions that launched in a collector set earlier this year. It also marks the first of five to be issued in the series this year. 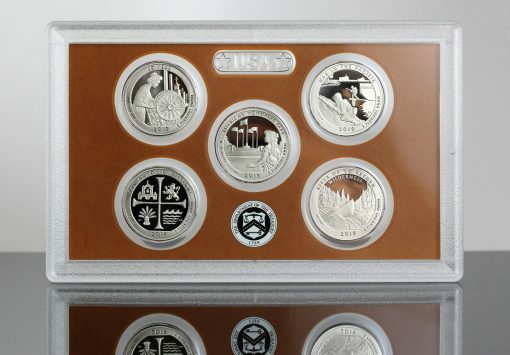 The complete series includes a total of fifty-six new quarters. Each honors a different national site with one chosen from each state, the District of Columbia and the five U.S. Territories. Five ounce silver coins containing the same imagery as the Lowell quarter are also produced by the U.S. Mint. This includes three-inch bullion coins sold through the Mint’s network of authorized purchasers. It also includes three-inch, five ounce .999 fine silver uncirculated coins. The uncirculated Lowell National Historical Park Five Ounce Silver Coin is scheduled for release on Feb. 7. It will sell for $154.95 and has a mintage limit of 20,000. At least it’s not another bird. Beauty is in the eye of the beholder. Can you do better ? Maybe you should submit your renditions so we can all take potshots at them. I’m expecting a slow incline with no end in sight to be honest. youll see these very slow dips or “pausing” throughout the weeks, but look for 1330 to 1340 very very soon… the time to buy is NOW, do not stall any longer. i use bullion exchanges no bs or other fees. check them out. Don’t buy from the Mint. They sell it to you at a higher price than what it’s worth. Get the ATB 5 oz coins from Ebay, Amazon, or your local coin shop.